Ready to start doing business with pros and build a FREE successful brand powered site? Registration is completely FREE. So you can start earning money right with no up front fees. 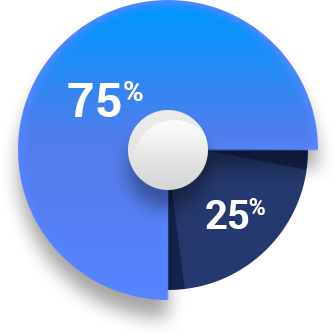 You receive 75% of the net revenue, while Shopmaker takes the remaining 25% to cover storage/ hosting/ support/ software, among many more features! Note: There is a 10% processing fee on all transactions before anybody receives their percent. This is the banking company who takes this share and it is the standard industry wide. Do I keep ownership of my content? Of course. We are only here to supply you with the tools and assist in any way we can to help you achieve your financial goals. You are free to register and close up shop as you please, we do not own the rights to your content. How often am I paid / How will I be paid? We pay out monthly. Every second to third week. You choose your method of payout, currently we offer SEPA (EU customers) or PayPal. How much will a site cost me? Nothing to start up. However Shopmaker takes a 25% cut for bandwidth, storage and customer support. That’s 75% of PROFITS, so you have nothing to lose! The minimum payout is €100.00. The amount is customizable and can be raised in the admin. There may be exceptions to this rule so we can pay out lower amount, too. What if I want to close my site? No problem, as long as all active users have expired or refunded their membership fees for the month. Otherwise all active members will need to retain their access to the site and your materials until expired in order to avoid chargebacks and money loss. At first request, we will close down your tour so that you do not receive new registrants. Surfers will be forwarded to a page with a login link until members have expired. Yes. You can either use your own domain or get one for free through our site.